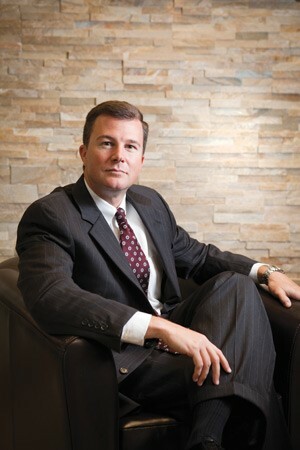 Johnnie Baxley C’92 is a partner at Willson, Jones, Carter & Baxley, P.A. After graduating from the College of Charleston with a B.A. in Political Science, Baxley attended the University of South Carolina School of Law. He currently lives and practices law in the Charleston area and is active on several boards of the College. Check out the Q&A below to learn how Baxley’s experience as a political science major led him to law school and beyond. What motivated you to go to law school and become a lawyer? Did you start out college knowing that would be your career path? I started at the College thinking that I would major in one of the sciences and go to medical school or go into orthodontics. However, I did not enjoy those classes. I took a political science class and really enjoyed it. I had been on the debate team in high school and had several friends who were thinking about law school, so it was certainly on my radar. After that class, I had a long conversation with Dr. Bill Moore who encouraged me to pursue political science and law school. Once I moved into my later years at CofC, that was the only career option that I even considered. How do you think the skills you developed through the political science major have helped you in law school and in your career? The political science major teaches students to think critically, to advocate a position and back it up with logical arguments, and to write effectively. The major also teaches important skills like reasoning, persuasion, and logic. As a political science major, one learns to effectively and persuasively communicate, both verbally and in writing. Students also learn how to gather information and organize it for a purpose, analyze and assess information, and organization skills. All of these skills were extremely helpful in law school, and these skills continue to be important in my legal career. What do you believe was the most important take away from your undergraduate experience? Balance. I learned fairly quickly at the College that it is possible to be a good student and still have a lot of fun. I knew folks that were really good at studying and made good grades but did not involve themselves in college life. I knew others that saw college as a huge party and cared nothing for their studies. There is a balance between these two extremes that allowed me to experience the best of both worlds. I was able to make good grades and do well academically, but I was still very involved in clubs, organizations, and sports on campus. That experience, and the lesson learned, has served me well throughout my career. It is possible to have an effective work/life balance and to have a successful career and successful family life. What did you enjoy most about your time at CofC? So many things! Basketball games, hanging out at College Lodge, my fraternity experience with Pi Kappa Phi, intramural sports, spending time with Dr. Moore, Student Alumni Associates, and the list goes on. Living in downtown Charleston for four years was amazing, and I wouldn’t trade the experience for anything. I loved my time at the College. You moved back to the Charleston area after law school and now practice here. What made you want to stay in Charleston? My wife and I both grew up in the Charleston area, and we couldn’t think of a better place to live and raise our family. Charleston is a wonderful place. We love living in the area – the people, the weather, the water, the history, the culture. There is a reason Charleston is repeatedly named the #1 city in the United States. What, if anything, do you wish you had gotten the chance to do as an undergraduate, but didn’t? That’s an easy one – study abroad. My parents had three kids in college at the same time, so studying abroad was not a viable option for me due to financial concerns. I absolutely love to travel, and the opportunity to journey to a new country and live there while studying in college would have been an unbelievable experience. It is something that we will strongly encourage our children to do during their college career. That experiential learning is something that simply cannot be duplicated in a classroom. Even for students not considering law school: what do you think is the most important thing students should know as they graduate from CofC? As a political science major, you are well equipped to succeed and excel in many various jobs and careers. The skills that one learns as s political science major are invaluable skills for lots of careers. If students combine those skills and knowledge that they learn at CofC with a strong work ethic and perseverance, success will follow.